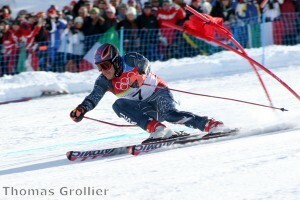 Alpine skier Bode Miller was once known as a wild guy. He was favored to medal in the 2006 Winter Olympics in Turin, Italy, but failed to deliver. He was often spotted in nightclubs and even gave a controversial "60 Minutes" interview in which he admitted to often skiing while intoxicated. Fast forward four years and Miller is back on top. At the Winter Olympics in Vancouver, Miller has not disappointed as far as his performance goes. He has several medals, including a gold, under his belt and he has a little girl to blame. Last year, Miller admitted that he had fathered a daughter. Neesyn Dacey, called Dacey by her dad, is now 2 years old. Miller says he almost quit skiing to spend more time with his daughter. "It’s tough being away. It’s tough to stay focused and perform well when you are constantly feeling like you wish you were somewhere else," he recently blogged. According to the San Diego Union-Tribune, Miller often flies from Europe to California to spend time with his daughter during training. "It’s really fun to hang out with Dacey when she’s this age. Kids learn so much so quickly and they watch so closely. They have a special relationship with their parents at this age. You basically are their entire world. And that’s kind of cool because by the time she’s 13 she will probably want nothing to do with me," Miller wrote on his blog. Miller also says he and Dacey’s mother are not together, but are good friends working on trying to be good parents together.